Left, the old look and the new layout on right. 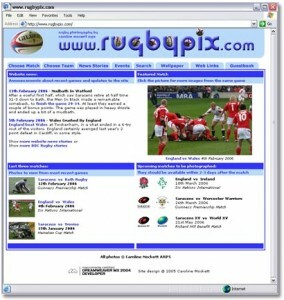 Rugbypix.com is a website presenting photos from Rugby’s Guinness Premiership and International tests. Each match has up to 20 photos to view, and there are full match and player details to be seen. This site has complex cross-linking, enabling visitors to quickly select photos from a particular match or team, or see all photos of their favourite player. An image search facility is included, along with frequently changing website news. A wallpaper download section allows visitors to save images to their desktop for use as their PC background, while a guestbook allows visitor feedback to be posted easily. 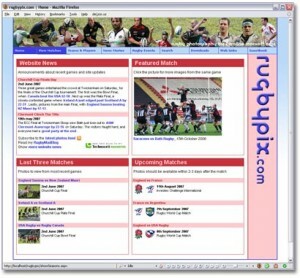 Rugbypix has been online since May 2005, but it was in need of a fresh look, as well as tidying up some code. The new site is still written with ASP.Net, but is now fully Web-Standards compliant.